Somebody has not paid his parking fees. 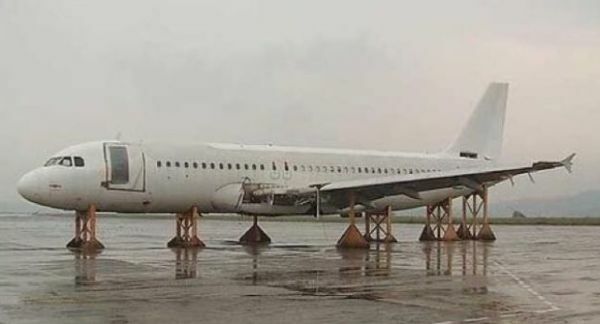 Business Travel News would like to learn whose aircraft this is and the airport concerned? Please complete "Our readers finest words" below and we will publish later in the week. Looks like its got webbed feet. Maybe Heathrow's new runway will be the Thames. They've Done It Again. Last night 3 teenagers were held by police for "bricking " an airbus 320. When questioned about the stunt, the answer they gave was because the pilot refused to wave back. Definitely Sydney Airport. They'd clamp their grandmother's wheelchair if they thought it might make them some more money. The company that runs Sydney Airport is rapidly turning the joint into Australia's premier third-world airport.